Kyle and I have transitioned from being a one-car family to being a two-car family once again. I bought my car in 2008 just after I started grad school, and we stopped driving it in 2012 but didn’t sell it, anticipating a time when we would need two cars again. That time came much later than we expected, but it has come. Anyway, we brought my car in for some repairs in the spring of 2012 and were presented with $1,600 in proposed work. 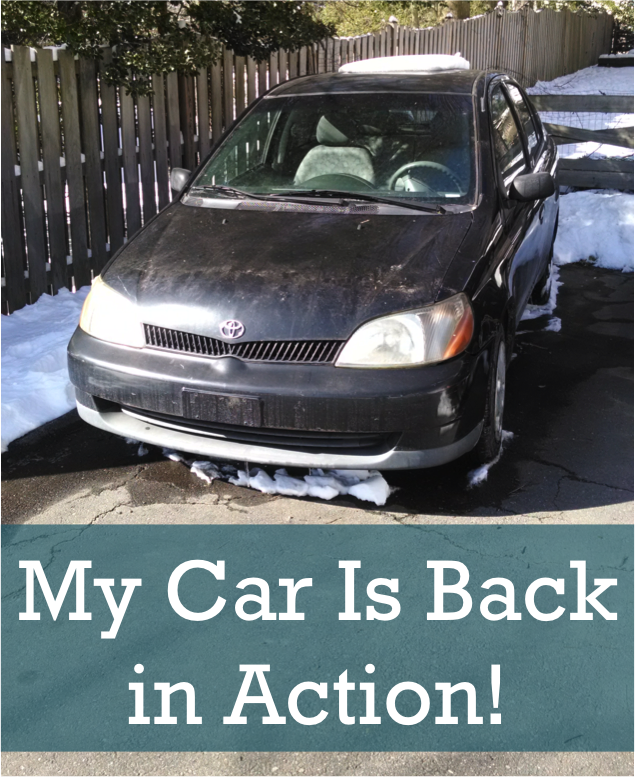 That was back when we didn’t have as much cash on hand as our targeted savings account balances were rather anemic, so spending that amount of money on car repairs was daunting. Instead, we decided to share Kyle’s car and stop driving mine. Since we were both grad students, that really only involved synching up our work schedules, which Kyle had been reluctant to do before that point. Pretty soon, we were extolling the virtues of being a one-car family. It was pretty difficult to estimate how much money we would be not-spending by no longer driving my car, but I gave it a shot. It turned out that the biggest regular reduction in expenses was actually due to sharing one parking permit, not spending less on gas or insurance. Since my car was paid off and older, it wasn’t much of an addition in terms of our insurance premiums, and it is very fuel-efficient so the gas costs for my short commute were pretty minimal. We estimated that we would be spending about $680 less per year with one car vs. two. In addition, we avoided putting three years of driving miles on the car and whatever associated maintenance and repairs those would have brought. To get my car back into driving condition this spring, we had to buy new tires (one of the recommendations from three years ago) and do some other repairs. Before we benched the car we had done $400 of the recommended $1600 of work and over the three years we also bought a new battery. So I was thinking that $1200 of work would be the minimum we would have to spend, and we prepared by saving a ton of money into our Cars targeted savings account. To our surprise, the mechanic (the same one we had used in 2012) recommended work that totaled $1,001.01 to get the car ready for the long road trip to DC. Then, within a day of completing the repairs, a warning light came on that cost us another $172.68 to fix. So it did end up being right around $1200 in work, but distributed differently. Kyle wasn’t happy that they hadn’t caught the warning when they did the initial repairs because they had to redo some work and wouldn’t give us a discount, so he ended up talked with a couple other mechanics in the area about how much that repair should cost. One mechanic told him he shouldn’t have put $1,000 into a car so old and that we should have just bought a newer car rather than bench it for three years. He said we’ll always have problems with this car going forward. I tried to reassure Kyle that mechanics are not personal finance experts and that it’s much more economical to keep driving an older car than to buy a newer one, especially as the car has not yet indicated that it needs frequent maintenance/repairs (it’s a Toyota and has less than 100,000 miles on it). But that comment did bother me somewhat, especially because we haven’t created an explicit plan for at what point we definitely will sell the car. Getting the car inspected and re-registered was actually a breeze. The DMV didn’t require a new registration but rather just renewed my old registration. They didn’t seem phased by the car having been unregistered for that time but still in state, and only charged me one year of property taxes instead of all the possible back taxes. Time will tell if the car did experience some degradation in its three years of not being driven. If it turns out that we totaled it or something by doing that, then I guess it was a bad idea or poorly executed. But the benefits to sharing a car that we experienced were definitely worth the few inconveniences of having to ask for a ride from a friend or take the bus from time to time. Even though it didn’t help us spend much less money (a testament to how inexpensive it is to operate in the first place), there were plenty of other non-monetary benefits. Have you transitioned among having 0, 1, and 2 cars in your household and how did they go? Do any of your prized possessions get disrespected by those close to you? When is the right time to sell an older car? 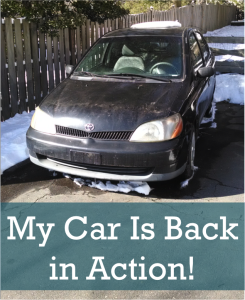 15 Responses to "I Love My Car Even If No One Else Does"
We became a 0 car family after the repair costs were a bit more than we could stomach. It probably evens out when you consider that we’ll eventually need a new car but right now, we’re enjoying a bit more walking / not dealing with parking or traffic. I’m trying to hold out as long as possible. My husband has serious car envy and says as soon as we’re expecting, he’s buying a car but I’m sure people have babies without cars and do just fine, right? Depends where you live! If you can walk to the grocery store, pediatrician, and day care, you could be fine with a kid and no car. Or get a bike and trailer! I have a car but I rarely use it. My bike to car mileage ratio is 4:3. Fiby recently posted..My April Vacation to Korea and Japan Booked with Miles! That’s nice that you can have a no-car lifestyle. I think sometimes we need to be pushed into stretching ourselves, but ultimately it is a good thing! As for the babies, I guess it depends on your city. Not sure what needs the baby would add that you don’t already have except getting medical care more frequently. You really never know how much you will get out of it so it’s impossible to make a “smart financial move” general commendation. If you get a while, it’s worth it; if you don’t, the repairs are a sunk cost that you can’t put into the new car. We made a similar gamble this summer, putting $1200 of work into an old car, but the (previously healthy) engine suddenly died three weeks after the last repairs. Sounds like your luck is better so far – run it into the ground! It is a gamble; sorry it didn’t work out for you. 🙁 I was pretty OK with putting money into this car because even if it’s getting a bit old (a 2002), the miles are quite low. Did you buy another car? I am pretty sure I would feel a huge loss of independence if my wife and I decided to give up one car. First it would be almost impossible for us to sync up our schedules. Mostly because my day can be anywhere a typical 8-9 hours to a much longer 12-16 hour day. Also as you mentioned it really wouldn’t save us much money since we both work really close to work (about 5 miles) and both the cars we own are paid for. But totally with you on getting the most out of our cars for as long as we can. Our cars are relatively new (2011 and 2012). So I don’t even plan to think about a new car until 2021 at the earliest. Independence is not a big value in our marriage. 🙂 We loved having the quality time together that sharing a car forced us to, both during the commute and because our schedules were better synched. The variable workday is harder to deal with, but if one of us wanted to stay at work into the evening the other would just drive back to campus to pick up. It didn’t save any money on gas over commuting separately, but it saved the person being picked up a lot of time because of how far away our parking lot was from our building. What do you think will be the reason that you eventually buy a newer car? As I said, I’m not really sure how to judge when a car is done. I switched to driving Keegan’s car to work because it gets better gas mileage than mine and he always makes fun of my car! It was originally sold in 2005 (2007 to me!) so it is pretty old… But I don’t have a car payment and he does have one for the next 6 months or so. I guess that is my car’s saving grace (but my seats are definitely more comfy and my sound system is way better :-p. We’re hoping to make it last another 2 years or so and since he only drives about 5 miles a day to get to the Bart station I’m optimistic we will meet that goal. Sounds like you have a bit of a competition going with your cars! I admit I did a bit of the same when I started driving Kyle’s car regularly but now I like it fine and he apparently likes mine okay, too. A need of of another car arises in your situation, Emily. Our family has two cars, but there is one car we’re always using. We’re still waiting for the right time when we can sell the other car. Maybe when there’s more demand of it. My parents have a car they’ve wanted to sell for like 2 years but they just haven’t yet. I say just do it! The price can’t be that important in comparison with the hassle. My boyfriend actually is for buying used cars and I’m for buying new cars, so it’ll be interesting to see what we end up doing for the next car when it comes time for that! Kyle and I have a similar disagreement of newer used cars vs. older used cars. I hope it will also be a long time for us until we need to make another car purchase!